Audio editor is a very useful tool because it is widely used in daily life. For example, it lets you make special ringtones or text alert for your phone. It also helps to resize or remove the useless portions in audio. Moreover, the tool enables you to mix, overwrite and insert sound for recreating music. 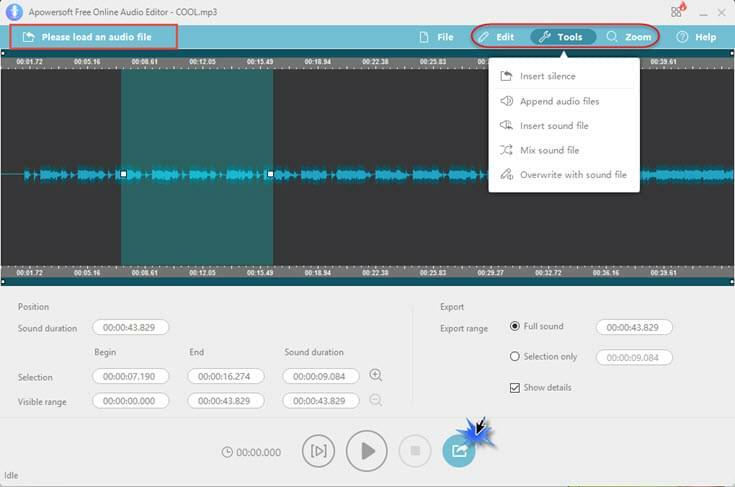 There are many audio editors available on the Internet, but some users tend to utilize online MP3 editor because this kind of tool require no installation and is easy to handle. Continue reading this article will reveal the best audio editors in 2016 which will allow you to edit audio files on the browsers directly. Apowersoft Free Online Audio Editor is a very powerful tool which edits audio files online rapidly. Working smoothly on both Mac and Windows, it provides many practical features. It lets you trim, cut, merge, split, copy and paste audio easily. There’s no time or size limitations, you may edit the files as long as you want. Moreover, it is capable of appending, overwriting, mixing and adding a variety of effects to enhance the audio in accordance to your preferences. To use it, new users will be required to install a launcher. Afterwards, the tool will run smoothly. You can load one or more files into it, then select the options under “Edit” and “Tools” menu to edit audio files online. To check the result of edited audio in real time, just click “Play” or “Play selection” to pre-listen the file. TwistedWave is one of best free audio editors which supports multiple platforms including web, Windows, Mac, iPhone and iPad. This tool can help you cut and trim a single sound file. It as well allows users to add effects on audio such as fade in, fade out, change of pitch/speed and more. Better still, this tool lets you record from a microphone which can be helpful if you want to add narration to the audio file. 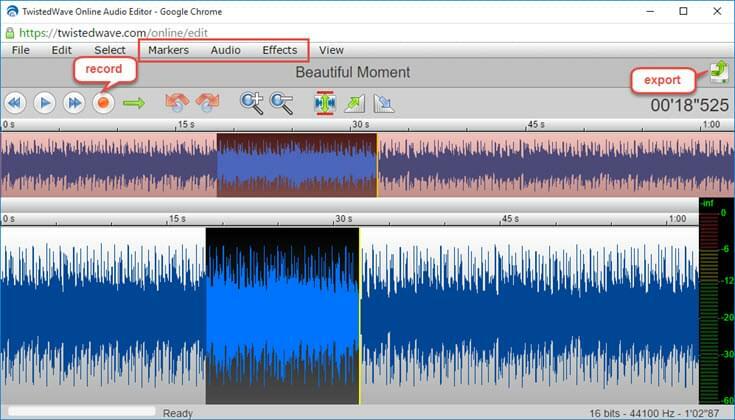 However, this tool sets the limit on file duration which supports to edit audio within 5 minutes. If the file you’re editing reaches its maximum limit, it will ask you to subscribe for a plan which cost $5-$20 per month. In this case, merging audio is impossible. Furthermore, the speed of uploading sound file is rather slow if you are a free user. 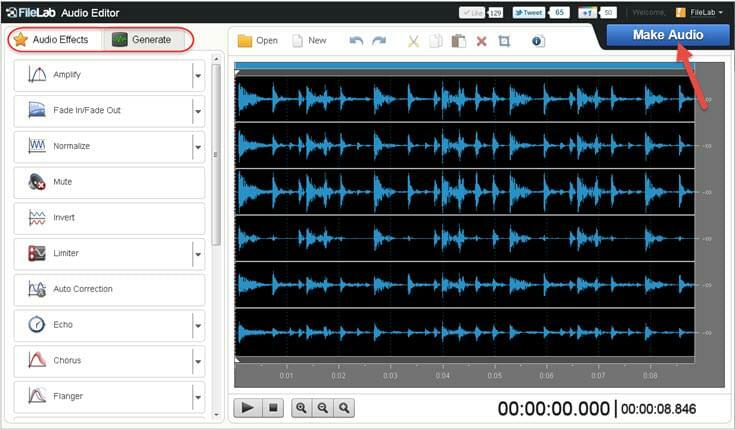 FileLab Audio Editor is also a web-based audio editing application which edits audio tracks by allowing users to split, trim, cut and mix them. It can also be used to apply various instrument effects and save them in MP3, WMA, FLAC and WAV formats. It is fast and convenient to use. Just note that this online audio editor requires users to download a plug-in before usage. After downloading and installing it, the editor will be activated after you hit “Launch FileLab Audio Editor” button. Yet, there are instances that the site is down or the tool cannot be loaded even though you have launched the plug-in. It means, this tool is not so stable. This is a very simple online MP3 editor tool which helps users to cut audio file flexibility. If you are just doing a basic cutting, then you might want to consider this. To use it, simply go to Audio Cutter page, click on “Open File” to import the audio. Except of importing local audios, you are able to import audio from Google Drive, Dropbox and specific URL as well. Then, drag your mouse to select the part that you want to cut. Next, choose the output format such as MP3, iPhone ringtone, AMR or others and click “Cut”. Lastly, click the “Download” button to get the edited file version. If you think this MP3 cutter cannot meet your needs, please check the next program. Hya-Wave is able to do efficient audio edits which includes cut, split, append, join, add effects etc. To use it, go to its page and you’ll be asked to drag the file onto its interface. Once done, the editing options will appear. According to your need, select the desired ones and play the audio for checking the effect. Click the “Disc” icon on the upper part, then click the “Share>Export file” button to download the file into the computer. This tool does not require you to install extra extension, but you first need to sign up for an account for saving your edited file. The edited file will be saved on your online account, then you can share the sound to Facebook, Google+, Twitter or download it to PC. Those are the available tools to edit audio files online. If you are looking for the more powerful tool, Apowersoft Free Online Audio Editor, TwistedWave and Hya-Wave are good choices. Yet, Audio Cutter provides the fastest solution to edit audio simply. Rating: 4.1 / 5 (based on 30 ratings) Thanks for your rating! wow.. i am looking for iphone garage band of edditing audio please??? The TwistedWave which has been mentioned in this article has the iPhone app. It is a nice choice for editing audio simply, you can give it a try.